Explore the Colorado River by kayak on a full-day tour from Las Vegas. 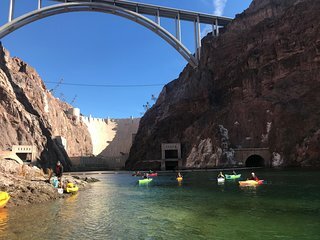 Hop in your kayaks at the Hoover Dam and travel 12 miles (19km) down the river, stopping at hot springs, Emerald Cave, and beaches where you can swim or sunbathe. Your guide keeps an eye out for bald eagles, falcons, big horn sheep, and other wildlife. Choose from three morning launch times on a tour that includes use of equipment, picnic lunch, snacks, guide, and round-trip transport from hotels on the Las Vegas Strip. Check in Point: Hoover Dam Lodge location west parking lot 30 min prior to each launch time .